I am creating an Excel Add-In using Visual Studio 2010. I would like to run some code when users clicks a combination of keys. The Add-In when installed shows an error on clicking the short cuts. It says the specific macro cannot be found. The code under the Sub EnableShortCut() works well when it is in an excel vba module. The same won't work when it is added to an Excel Add-In created with Visual Studio. Some one out there please help me to resolve this issue. "I would like to run some code when users presses a combination of keys." C# version - the original that the above vb.net code was converted from - but I had to use Reflector as CodeConverter & devfusion didn't do it correctly. //declare the mouse hook constant. //For other hook types, you can obtain these values from Winuser.h in the Microsoft SDK. //Note that the custom code goes in this method the rest of the class stays the same. //It will trap if BOTH keys are pressed down. You'll need to put code in the HookCallback() method in the above code to trap events when key combinations are pressed, I've given you two examples Ctrl + Shift + 7 and Ctrl + 7 to get you going. This is difficult to do, the Application.OnKey() method is very restricted. It can only call a macro and cannot pass any arguments. Which means that you'll have to provide a set of macros. You don't want workbook specific ones, you need macros that work in any document. Let's tackle that first. Repeat as often as necessary, you want one for each shortcut key you want to define. Click Save. You now created a file in c:\users\yourname\appdata\roaming\microsoft\excel\xlstart\personal.xlsb that contains the macros. Anybody that is going to use your extension needs to have this file as well, a deployment detail. Just a simple one that exposes a single method named Command() that takes an integer. 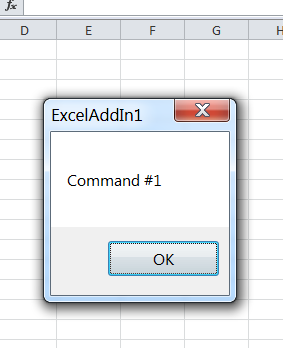 I'm just used MsgBox, you'll want to write a Select statement to implement the command based on the value of index. Also note the match with the code in the global macro. Using Excel-DNA (an open source .NET / Excel integration library that I develop) the methods and user-defined functions in your .NET code are registered with Excel through the C API. As a result the behaviour is closer to that of VBA, and your code with the Application.OnKey "..." strings would work too. Excel-DNA allows your code to be in a compiled .NET .dll assembly or directly as text in a '.dna' file which is processed when you load the add-in. Here is an example of a such a text file (the code would look the same if it were in a compiled project). As mentioned in one of the other answers, I have renamed the macros so their names don't clash with the cell names A1 etc. match it with a copy of the Excel-DNA host library ExcelDna.xll from the release on CodePlex, which you just copy and rename to OnKeyTest.xll (the matching name is how the .dna file is found when you load the .xll). These two file would form your complete add-in, just needing .NET on the machine to run. First thing A1, A2, A3 are considered as cell address. Run your project this should work, Application.OnKey in Excel or Application.Keybindings in Word takes the Macro name as parameter. Not the answer you're looking for? Browse other questions tagged vb.net visual-studio excel vsto excel-addins or ask your own question. How to get the “KeyPress” event from a Word 2010 Addin (developed in C#)? How do you default a new class to public when creating it in Visual Studio? How to disable zoom on Ctrl+scroll in Visual Studio 2010?